The bike inner tubes used to make this billfold get a second chance at life in your back pocket. Undeterred by the theft of his beloved messenger bag, avid cyclist Eli Reich made a new one out of inner tubes, and he's been upcycling ever since. Instead of languishing in a landfill, the bike inner tubes used to make this billfold get a second chance at life in your back pocket. It features four card slots and a compartment for your money, while the exterior sports a reflective strip handy for finding your wallet in the dark or flagging down a cab for an evening out. Slim and stylish, it's a great fit for gear-loving guys. Handmade in Seattle. Like any avid cyclist, Eli Reich loved his messenger bag. So imagine his disappointment when it was stolen. Not one to be derailed for long, he turned this loss into an opportunity. Using a borrowed sewing machine, he crafted a replacement bag from the bike tubes he had lying around. Everyone who saw Eli’s creation wanted one of their own, inspiring him to quit his job and launch a new venture transforming recycled bicycle and truck inner tubes into sleek, stylish, and sustainably produced bags and accessories inspired by the urban lifestyle. My son needed a wallet after his was stolen. I saw this and thought this would be unique as he loves to ride bikes. It is of good quality and super light weight. The reflective stripe really helps to make the wallet unique. My son loved the wallet and said it was better than any he had picked out. So glad I went with my gut with this purchase. I knew he would love it! This was a gift for my son. He is an avid cyclist who has gone through a few tubes! Cute way to show the second life of a bike tube in a fashionable wallet! Repurposed fun! The wallet is lightweight, thin, and well made. This will make a great gift for a bike lover or anyone really, who doesn't need to carry a lot with them when going out. Couldn't believe how appropriate this gift is in so many ways. Biking, recycling. 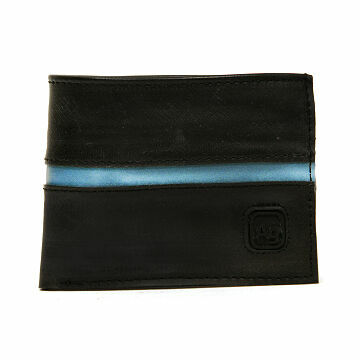 Very thin and still holds the same amount that his old leather wallet did without the bulk! My husband really likes this wallet. The reflective strip is very reflective. Excellent gift for my boyfriend who is a cycle fanatic! !